University student Rima fled war-torn Syria with her mother Fatima in January. They survived a terrifying journey across the Mediterranean before landing on the Greek island of Leros in January. “We almost sank at sea once,” she said. 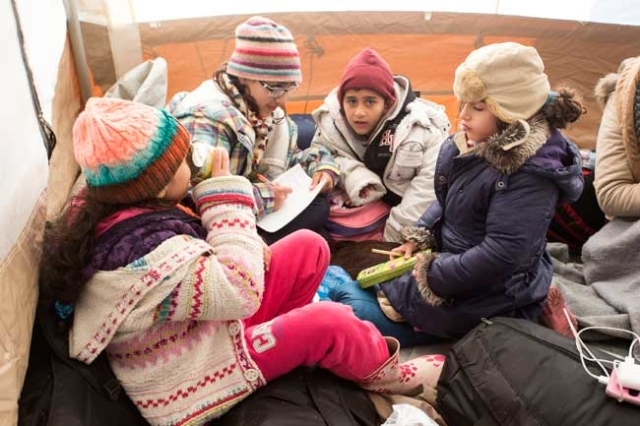 Rima and her mother are among thousands of refugees from Syria, Iran, Afghanistan and other countries who are being supported by Caritas Hellas at Idomeni in northern Greece on the border of Macedonia. They are hoping to be reunited with Rima’s brother and aunt who now live in Denmark. Rima was studying electrical engineering at home and is still shaken by what she saw in Syria. Hiwa comes from Iran but tells officials he is from Afghanistan in the hope that he may cross the border. 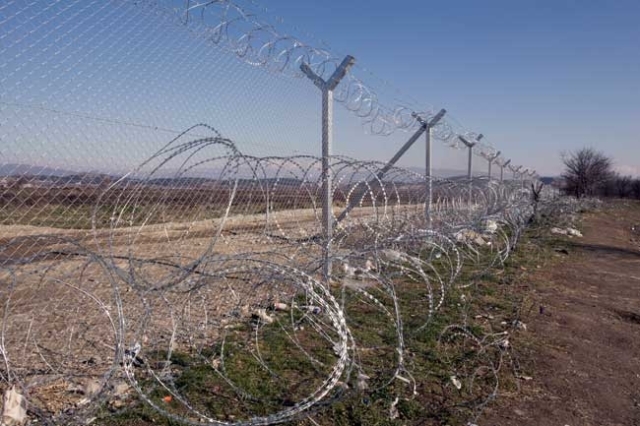 Since tighter controls have been introduced, only Syrians, Iraqis and Afghans are allowed to enter Macedonia. Hiwa is travelling with his wife and tiny 18-month old daughter, Atina, and hopes to get to Sweden where they have relatives. Idomeni is on the border of Greece and Macedonia, around 80 km north of Thessaloniki. Snow-capped mountains can be seen in the distance and temperatures fall well below freezing in winter. More than 930,000 refugees arrived in Greece in the past 12 months. Last year several thousand people were crossing the border at Idomeni every day but now there are tight restrictions as Macedonia only permits refugees from Syria, Iraq and Afghanistan to continue their journey. It’s supposed to be a brief pit stop but many of the migrants are told they may be here for a couple of days. Every day Caritas Hellas distributes bags filled with biscuits, fruit and bottles of water. Caritas volunteers also provide raincoats and other clothing to those in need. 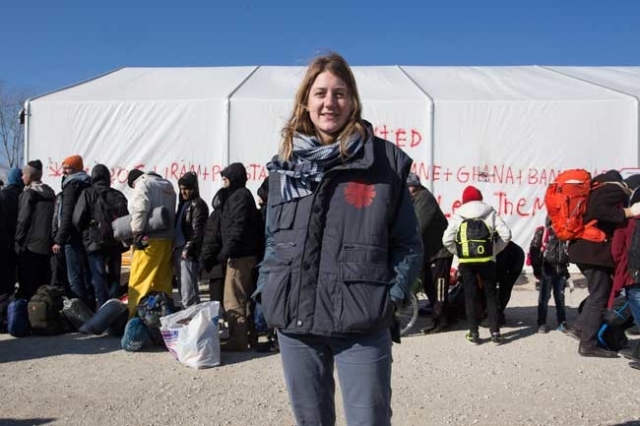 “The situation is terrible, it’s a human tragedy,” said Rino Pistone, who is co-ordinating Caritas’ aid distribution at Idomeni with 20 volunteers. Caritas has provided 40 chemical toilets and five showers at the site while volunteers have handed out more than 80,000 bags of food and water, 4,000 raincoats and more than 2,000 backpacks in recent months. Pistone, an Italian, has been leading Caritas operations here since September. Despite the demands, he finds it rewarding.“It’s exhausting work but the migrants really appreciate what we do. It leaves me feeling very emotional, with this kind of job it’s always difficult to remain detached from your emotions,” he said. Migrants not only have to battle the severe winter weather, many are forced to walk long distances with no idea of whether they will be able to reach their desired destination. Azad, a young Kurdish man from Iran, travelled overland from Turkey to Greece two months ago. “We crossed four rivers, we walked for 13 hours. There were 12 people, six women and six men – a Syrian family and me.” He said he was imprisoned for six weeks when the Greek authorities discovered he was from Iran. When he was released he went to Athens and found a smuggler who encouraged him to walk with him across the border and then take a car. A former political activist from the PDKI party in Iran, he is afraid of being sent home. “If they catch me they will put me in prison, maybe hang me, like they did to my friends,” he said. Rameen has just arrived from Afghanistan with his younger brother ‘Safi’. The young father has left two young girls under the age of five at home but hopes to bring them to Europe one day.